If you get a Microsoft Works WPS file, here’s the easy way to convert it to Microsoft Word DOC or DOCX format. Now and then, someone emails a document with a WPS extension. WPS files are word processor documents created by Microsoft Works, and whenever I get one of these, I feel like someone just handed me a cassette tape with their demo on it—come on, this isn’t 1980 man! Where am I supposed to find something to play this thing? UPDATE: Two things: Cassette tapes have made a major comeback among hipster indie bands and Microsoft no longer offers the Microsoft Works 6-9 File Converter for download. Microsoft Word 2016 has some built-in MS Works .wps conversion capabilities, so I suggest getting a copy of Word 2016 (free trial of Office 365‘s a good idea) and trying to open your .wps file in that. Barring that, you can still download the Microsoft Works 6-9 File Converter from some semi-shady file hosting sites. I can confirm that I got a legitimate copy from FileHippo. If you download something from one of these sites, be sure to verify the MD5 hash is C288290A866B2F92A11FB07F7077F42C. I like to use a program called QuickHash to check MD5 sums. Also, make sure the software is digitally signed by Microsoft. Graham Mayor has also made a Microsoft Works Converter for Works version 6 and earlier. This program is not an official Microsoft product, but it might be worth a try. Anyway, if you’re like me, and you have Microsoft Word 2007 or Microsoft Word 2010 on your computer but no time machine to take you back to the year 1991 so you can run Microsoft Works, that WPS file will be about as useful to you as a wax cylinder full of piano rags. But instead of firing back a snarky email to the person who sent you the WPS (or perhaps a fax would get through to them in the old-fashioned manner to which they are accustomed) asking them to re-send the file in a format suitable for the 21st century, you can do the polite thing and convert it – which is exactly what I’ll show you how to do in this groovyTutorial. Google “Convert WPS to DOC” and your top hit is going to be Zamzar.com. I’ve used Zamzar in the past, and it’s a pretty good service. But I don’t like that they collect your email address. They promise that they won’t rent or sell your personal information but intentions are one thing and being targeted by hackers is another. I’m not saying that Zamzar isn’t as good a steward of your personal data as they say they are, I’m just advocating not taking any undue risks. 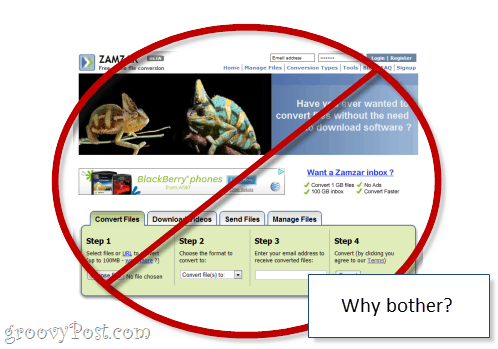 It’s also best practice not to be uploading any potentially sensitive documents, even if Zamzar does offer encryption. Finally, it’s a pain to have to wait for 10 to 15 minutes for Zamzar to convert your file and email it to you. Never use a third-party service when there’s an official solution. That’s my motto. And with the WPS issue, there is one. It’s called the Microsoft Works 6-9 File Converter (link defunct), and you can download it for free from Microsoft. See update at the top of this post. 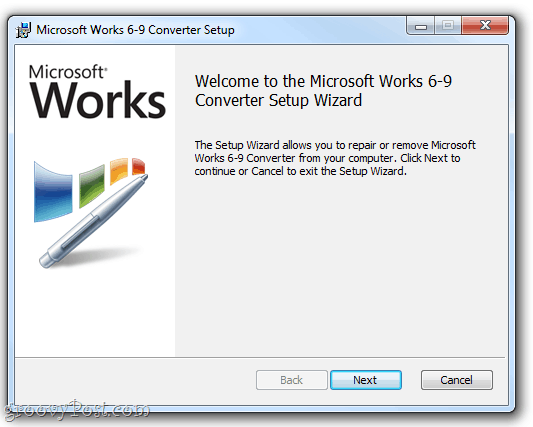 Download and install the Microsoft Works 6-9 File Converter. This process is pretty straightforward; just run the MSI and follow the on-screen instructions. After the installation is complete, locate one of those pesky .wps files and Double-click it. Now you will have a dialog that reads “Windows can’t open this file: ….” It’ll continue, saying, “To open this file, Windows needs to know what program you want to use to open it,” etc., etc. 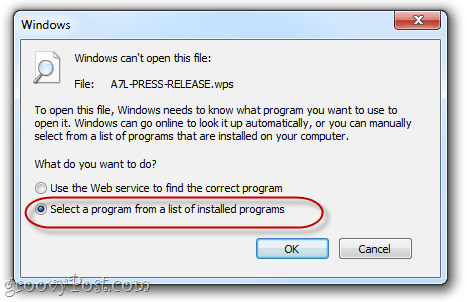 Choose the second option: Select a program from a list of installed programs and Click OK. In the Open with dialog box, Select Microsoft Word. 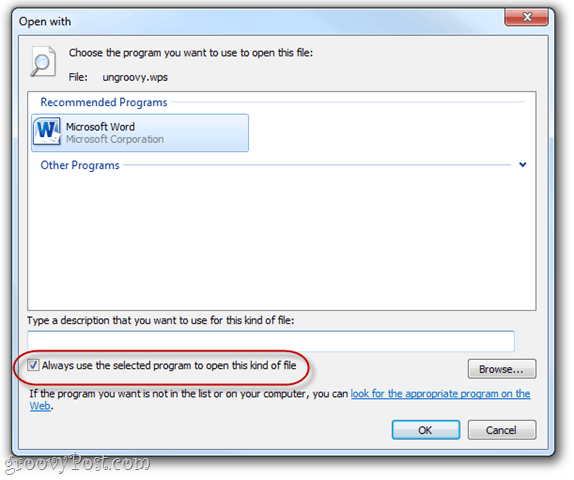 Check Always use the selected program to open this kind of file and Click OK. 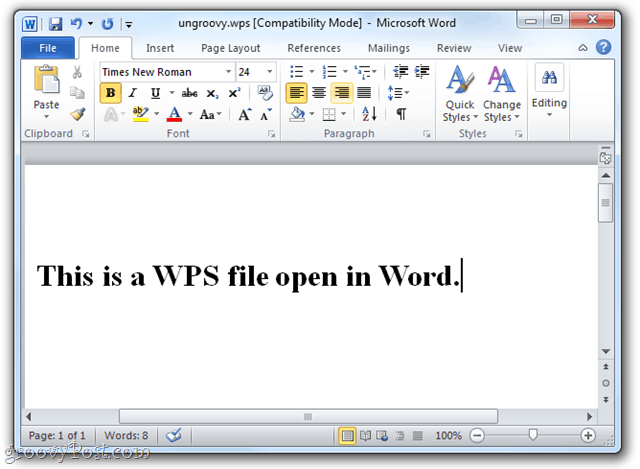 Enjoy your WPS file in Microsoft Word. If you feel like saving it in another format, just Click File > Save as and choose a different format. Problem fixed—permanently! 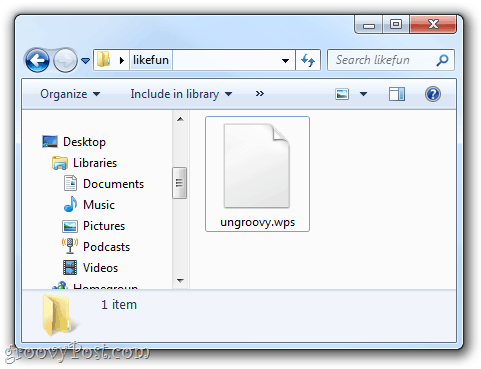 Now, all you have to do is Double-click.WPS files in Windows Explorer to open them. No more uploading your junk to Zamzar. Thank you for the article. It was very helpful. My 60 year old mother still uses Works and calls me about once a month with these types of issues. What I was looking for was a way for her to convert the works files into word rather than having the recipient do the converting. I don’t think that this is possible without her having actually having Word. Do you know of any solutions other than me shelling out the $100 to buy Word? She rarely uses the computer and only needs Word and email. You can also use OpenOffice which is free to download and very compatible with Office. I am still unable to open .wps files and I have OpenOffice. When I try to open .wps files with it, it just seems to draw a blank. Any suggestions? I have the same problem with W 10. I can get doc’s open on my PC sometimes by using 6-9 but my Next Book, where i store my poems so I can take them with me still won’t open some of them. So, I have the MS Snipping tool and so I just make the text just fit into a page and take a picture of it with the snipping tool and save it to my desktop…then just drag it onto the poem folder in the NextBook. It comes out great as a picture. U can try open libreoffice Jill. Its the open source solution to your problem. Thank Ro – I used Libreoffice and it’s opening up all my files! Great program. LibreOffice !!! Stick it to the man–in this case, Bill Gates and crew! hahahahhahahaha! This works great for Works .wps files! Allelujah! Dude. Thank you! So fine. When I double-click one of my wsp files as instructed in Step 2 for the 6-9 convert, Word just opens the document! How do you convert Works spreadsheet and database documents to Word or Excel? I tried making Word tables out of my Works spreadsheets but the data doesn’t fit, even with adjusting the columns, making the font smaller, etc. Failed. Downloaded both works 4 and 6-9 converters and still tells me I need a more current version. is Doxillion a good program to download to convert works files to word files? I need a program that is the best but also free! I recall downloading Doxilllion into a laptop (sadly now bust) and it did convert Works wps files. My problem is I have several years of family history research written up ready to print which have photographs inserted into the pages and may have to upgrade my desktop and am uncertain if I can transfer these files in a way they will still open, can be edited further or new sections inserted without having to do the work all over again. I have a disc with Office 2010 which I am told will do this but I understand it re-formatts. That would be lovely, save that apparently the converter isn’t compatible with my system for SOME reason. So I can’t install that converter. Ugh. Back to goggle.. Absolutely Brilliant, Thank You. I’ve been trying to upload my CV to varios Temp Agencies without success until I had your help. Adam Gibson. I tried following your instructions (which I think are awesome the way you put them together) but was unable to open up any of my wps documents. I get a pop up window saying that “there is not enough memory or disk spce to convert this document” which is bogus since there is plenty of memory available. What do I do ? Do you get that error when you try all WPS documents, or just the one? Do you have multiple versions of Office installed? I get the error message with all of the wps docs. 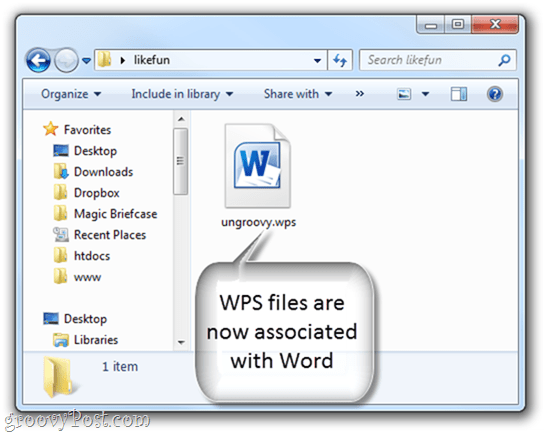 Looking back on it, I thought they were all word docs, could there be a virus or something that was done that converted all the word to wps ? The only other thing I can think of is reinstalling the converter. Make sure you uninstall any other versions of Office, including trial versions before you install the converter. If you’d like, you can send me one of the WPS files and I can try it. Or you can try Zamzar with one of your files. If it works, you know there’s nothing wrong with the file. I downloaded the converter in Windows 7. What seems to happen is you run the application and get the license agreement prompt (EULA). Acknowledged it then nothing happens. I went into Word 2010 and tried opening the file – you need to change the file type to 6-9 converter. Then the wps file will appear. Click on it and it should open. Save it as a word doc. This is what is happening to me:Get the license agreement and then it just disappears without opening. I have no microsoft works or word on my computer. When I double-click (open) the .wps file, it has a box asking me to choose a program to open the file. (As it should.) I can’t open it with OpenOffice. When I choose that program, it does nothing. I can’t open .wps files with OpenOffice. So, now what? Help => is there a converter version for MS-Works 3.0 or older => the recommended options in this only deal with MS-Works Converter 6-9 or MS-Works Converter 4. My question : is there a converter available for MS-Works Converter 3 ? I don’t know if I’m having a problem, or I’m not understanding something but I don’t have an MSI file, the download is .exe, and after I open it, says that it’s installing, and then closes. Help? Excellent information. Question: is there any way to convert *multiple* works files into Word, instead of doing one file at a time, peacemeal. I’ve got hundreds of Works files saved from years ago! Any help would be really appreciated. Have 100s of Works 4.5 documents and spreadsheets to convert to Word/Excel. I downloaded the file conversion but still have to open each doc, save as version 97-2003 then open the 97-2003 doc and save it to Office 2010 version. Is there any way to select all documents and convert all at once to version 97-2003…then again to Office 2010 docs? I also am trying to convert hundreds of wps files to doc or docx format. Converting each individually is not a feasible option. I have read that sites like zamzar are not secure. Is there any other way that you can convert in mass, securely? Actually, just checked Word 2003 and it has this wizard too. Great stuff! Many thanks. It worked, just when I was about to give up. Just been reading the above and was a bit dismayed to see that you are crIticising Microsoft Works and calling it ancient. I bought a desktop…top of the range I might add…and this was on it in 2003 and a laptop a few years later and this was also on it. Have managed ok now with files sent to people with a few exceptions. Of course, technology is always changing but you should have no trouble converting the files. I can do it and I’m a novice! I can’t get my Microsoft works documents to open in Microsoft word. I have 2003 Office. Do you have a suggestion ? Hi, i followed every step of your detailed instructions. I have corverter 6.9 on my desktop. BUT when I double click on the wps. document, it DOES not open the dialog that you describe on STEP 3. so, please can you let me know WHAT to do next. Haven’t been able to install the works 6-9 converter. I clicked on download but no dialogue box appeared. The .msi is listed in recent downloads: should I delete it and try again? Quite a few people seem to have this problem but Microsoft communities has no answer. Time to update this article or delete it altogether because the web page for the Works converter doesn’t exist anymore. @Brian Tillman I am able to get to the Works 6-9 converter via the link in the article. Okay, for those having problems with installing this thing, be it Works 4 or Works 6-9. Most important, make sure EVERY word process is actually turned off, including those in the background that tend to run even 30 seconds after you turn of the last word file. The same goes for Outlook if you use Word for writing e-mails. Thank you, Jack, for sharing. However, after reading your comments about people who use Works as being primative; I felt the strong desire to comment. I use Works. I don’t want to, but after spending almost 2-grand on a home desktop & 2 laptops & a couple of tablets; I don’t have the dough to purchase the product key code Microsoft asks for when the trial period runs out. Just because a person uses Works doesn’t mean they are a relic. It could just mean they spent all their hard earned money on hardware, store extended warranty, anti-virus software & internet access (to search for & read your charming article). By-the-way, all my devices came with Works when I bought them in 2013 & 2014. Honestly, if something works for you — use it! Doesn’t need to have the “Brand” on it. Now that said — using Works on all your devices, what do you think of it? Does it get the job done? Microsoft word was able to convert the file, but the file is not aligned right. It seems like the compatibility is off. Is there a way I can convert this without these issues? Thank you!!!!! You are a genius!!!!!!!!!!!!!!! If you are gettings a bunch of meaningless characters in amongst some readable text, then it means that the document is in another format. Read through the other comments in this article. There is a link to the MS Works 4 converter, use that instead, then open the document from Office and save it into word format. I was approached with the .wps dilemma from neighbor whose business is still all done from MS works documents. After many mis-turn with google solutions I found Word Viewer 2003 to do the trick to open the .wps file. Since most people are using office 2010 or later they won’t support the conversion tools referred to most often as the solution. I’m still looking for the right conversion tool for .wks works spreadsheet conversion. Thanks for asking. I do a lot of genealogy and have made several spreadsheets to organize information and these are .wks I still don’t know where to go for conversion. I LOVED and still love ‘WORKS’ It was easy to learn and I am so accustom to it, I HATE to change, but I can not share with others. I could say, “That’s THEIR problem” and let it go, but….it’s family! HELP Microsoft, this is YOUR program..give us some help! will this converter work with windows 10? Just bought new laptop w/windows 10 already in it. Wont convert wps file. will this converter work w/windows 10? Wont convert wps file…. LibreOffice opened a scrambled WPS that both the Microsoft converters failed to. I made a £10 contribution, it’s open-source freeware, nice people, their stuff is simple, reliable and works a treat. Is the converter archived somewhere? The link works fine for me. Try a different browser. I have had major issues with Chrome and Microsoft sites lately. I have a 4 year old HP laptpp which came with Win 7. and Works. I used it with a Galaxy Note 8.1. which recognises wsp.. Now I have bought a Galaxy Tab S2 , 9.7. This does not recognise Works docs, wsp,and so I am having to convert all my wsp files on the HP using Save as, to docx.Can I automate this or mst I do it one by one? LibreOffice opened a scrambeled WPS that both the Microsoft converters failed to. I made a £10 contribution, it’s open-source freeware, nice people, their stuff is simple, reliable and works a treat. I am a dummy with this type of thing. I need to convert an old works spreadsheet to Excel so I can move it to a new computer that does not have works. This spreadsheet has lots of formulas. There is a LibreOffice program on the computer but most of the ladies at the church that uses the office computer likes Microsoft Excel/Word. Our problem is that we do not have internet yet. We are a very small church and have not had a need for internet. Can you walk me thru the steps. I do not know anything about LibreOffice. I am willing to try to convert because I know it will be hard to redo all the formulas. If you can will you email me the steps to my computer at home. Also if I will need to try the converter first can you tell me how to download it to a Memory Card. Any help you can give me will help. Valuable ideas ! I was fascinated by the points – Does someone know if my assistant could get a sample IRS 1065 copy to fill out ? So I tried opening the link with IE, Firefox, Chrome and Opera and all go to the Microsoft Site, but the site says the page is no longer available. Nor could I find the converter download anywhere on MicroSoft’s site. Sad news, and I have one that was sent to me to open and am not sure how to do it now. It doesn’t look like it has moved, but not sure why MicroSoft would make it hard to find or (at worst) remove it completely. I’m having the same exact problem. I’ve even tried searching their site and the converter does not come up. It makes no sense to not have such a handy program easily available. I use OpenOffice and can not open the .WPS files I was emailed. Microsoft Word 2016 has support for MS Works conversion, which may be why Microsoft removed the converter. Thanks so much. I have a problem though. Regrettably, I chose the option “always use this file type” when I chose Notepad to attempt to open a .wps file. Now I’m stuck. Any suggestions? Thanks! Thank you so much. The libreoffice suite works fast and flawlessly and I was able to save a file back as Excel and send it to one very grateful person who will think I’m a genius!